EVERYBODY WORKS! GOODNIGHT GOODNIGHT CONSTRUCTION SITE! 4 MORE! What do you want to be when you grow up? When you read Everybody Works, you will get to see people doing jobs that you might like to do! Look at the bright pictures! What tools do they use? 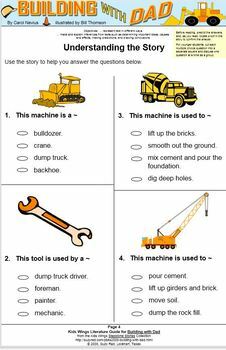 If you were a piece of heavy equipment on a construction site, would you get tired? If you got tired, what do you think you would do at night? From the crane truck to cement mixer to the dump truck to the bulldozer, and the excavator, all the trucks turn off their engines and say goodnight. 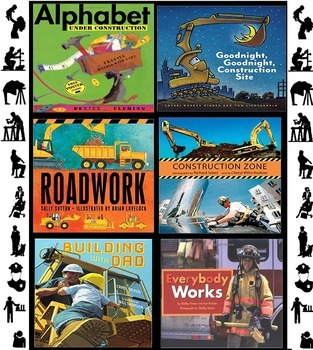 Goodnight, Goodnight, Construction Site is a delightful rhyming story of the trucks on a construction site. It will mesmerize even sleepy youngsters with its pictures of the building site and the mechanical workers who work and play hard all day long and then retire for a good night's sleep. What Am I? Name the trucks. If you worked to help build a road, what would your senses tell you? You would HEAR people shouting orders to one another. You would SEE the huge machines and HEAR their grumbling as they moved the earth and pushed and scraped a new path for the road. You would FEEL the ground shake. You will SMELL the exhaust from the machines and the paint being sprayed on the road. The words and rhymes in ROADWORK by Sally Sutton will make you feel like you are part of the fast-paced roadwork team. You will enjoy the rhythm of the the rhymes and will want to sing along with their onomatopoeia to complete the rhyme on each page. 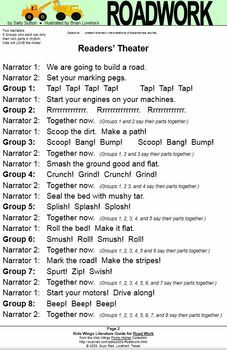 The Kids Wings unit for ROADWORK will help you work together like a noisy, reading roadcrew. Caution! Construction zone ahead! Anyone who has ever stopped to watch a big building going up — and who hasn't? — will be thrilled by this behind-the-scenes look at an amazing construction project. Put on your hard hat and step inside CONSTRUCTION ZONE! Young readers are invited to come on a virtual tour of a building in progress, led by award-winning photographer Richard Sobol. It takes hundreds of workers, thousands of trucks and machines, and millions of nails and bolts to transform an idea on paper into an actual building in which people will live, play, shop, or work. Every single piece of the construction puzzle — big and small — must fit together flawlessly. Logic Puzzle: Who Are the Workers? Would you like for your dad to be the one to build the new school? Then, if your dad took you to work with you, what would you see? In Building with Dad, You will get to go with him from the beginning of the construction to the finish. It's fun to read because the lines rhyme and because the pictures show the action from your perspective. You see things that are close-up as much bigger than those far away. 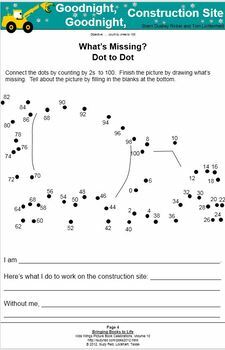 Building with Dad is a great book for Take Your Child to Work Dad! Afterward, your students can write their own stories about their the work their parents do! How do you build the alphabet? Mouse knows! He uses arts and crafts tools to help him construct a fun alphabet!